If not, please visit http://www.coco-cooks.com and update your bookmarks and RSS feed. Glamah-rous cook and baker. Thanks for visiting. I love to receive comments. This work by www.cococooks.blogspot.com is licensed under a Creative Commons Attribution-Noncommercial-No Derivative Works 3.0 United States License. Lakme ,an Asian Themed opera by the French composer Léo Delibes was my inspiration.Enjoy the Flower Duet. I come to look forward to each Daring Baker Challenge. Just when I think I have over come one baking hurdle, another is thrown out there! Ivonne and Lisa co founders of the Daring Bakers, along with Fran and Shea came up with a Lighter version of Opera Torte in honor of Barbara at Winos and Foodies,creator of the Live Strong Food Blog event. 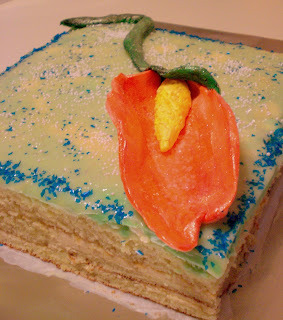 To celebrate life and spring we were asked to construct a Torte with lighter flavors and colors. Needless to say the creativity is unleashed. I have been seeing Pandan spring up over a few a blogs. It's the new Matcha Darlings! I found some essence and a can of actual juice in the store. I decided to use the essence for my Jaconde. 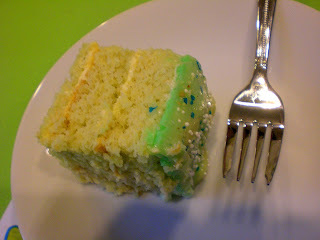 It didn't turn the sponge really green like I expected , but emitted a wonderful aroma combined with the almond flour. My syrup was infused with coconut cream to balance the Pandan.The butter cream was flavored with bits of while chocolate and Chambord.As was the glaze and mousse/ganache. My mistakes were a slightly overcooked layer of Jaconde( not enough batter for the second pan so layer was thin. I trimmed off the burnt parts and used this on the bottom. I loved the butter cream and will be using that again and again! And the glaze. I should have left it white but I colored it green. Well the mousse took a bit to set and I poured the glaze over it popped out in the glaze. A while later I lifted the square ring and more mousse flowed from the sides. I almost chucked it , but put the ring back on and went to dinner.Overnight it set properly and I added the remaining white chocolate over the green glaze. It got better. 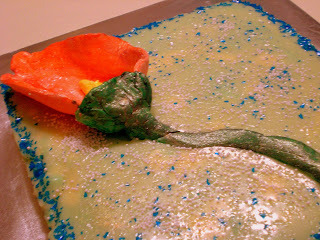 I then added my decorative touches such as my gum paste Anthurium and lustre and glitter to detract from the jacked up glaze. It was ready in time for a Mothers Day Brunch the next day with aunts and cousins. There were some Ohs and Ahhs, but people kind of looked like I was speaking another language as I explained the cake and what it was about. My Auntie Mame reminded me the family were Pound Cake and cobbler types.A few people claimed it was very rich but good. I guess their taste buds like it simpler. Oh well! I liked it and I'm happy once again I pushed myself.Check out the other DB's and their variations on this classic. L'Opéra!No, no! You don't have to write an opera, but you do have to bake one ... as in Opéra Cake!!! For those of you that don't know about this cake, it's an extremely elegant and polished French dessert that is believed to have been created around the beginning of the 1900s. Many people credit a gentleman by the name of Louis Clichy with inventing the cake and that's why it's sometimes referred to as Clichy Cake. So what exactly is an Opéra Cake?Well it's a cake that is made up (usually) of five components: a joconde (a cake layer), a syrup (to wet the joconde), a buttercream (to fill some of the layers), a ganache or mousse (to top the final cake layer) and a glaze (to cover the final layer of cake or of ganache/mousse).ARE YOU DIZZY YET???? Traditionally, a joconde is flavoured with darker flavours such as chocolate or coffee. But in honour of the season (spring in our neck of the woods) and as part of our decision to tie our posts in with the LiveSTRONG theme, we are making Opéra Cakes that are light in both colour and flavour.This means NO CHOCOLATE, COFFEE OR COCOA. But it does mean vanilla, coconut, lemon, almond or whatever other light flavours you can think of. It means NO DARK COLOURS when decorating your cake. But it does mean lots of white, cream, ivory, yellow, light blue, light pink, light green or whatever other light colours strike your fancy.A Taste of Light: Opéra CakeThis recipe is based on Opéra Cake recipes in Dorie Greenspan’s Paris Sweets and Tish Boyle and Timothy Moriarty’s Chocolate Passion.Reveal date is Wednesday May 28. For the joconde(Note: The joconde can be made up to 1 day in advance and kept wrapped at room temperate)What you’ll need:•2 12½ x 15½-inch (31 x 39-cm) jelly-roll pans (Note: If you do not have jelly-roll pans this size, do not fear! You can use different-sized jelly-roll pans like 10 x 15-inches. )•a few tablespoons of melted butter (in addition to what’s called for in the ingredients’ list) and a brush (to grease the pans)•parchment paper•a whisk and a paddle attachment for a stand mixer or for a handheld mixer•two mixing bowls (you can make do with one but it’s preferable to have two)Ingredients:6 large egg whites, at room temperature2 tbsp. (30 grams) granulated sugar2 cups (225 grams) ground blanched almonds (Note: If you do not want to use almond meal, you can use another nut meal like hazelnut. You can buy almond meal in bulk food stores or health food stores, or you can make it at home by grinding almonds in the food processor with a tablespoon or two of the flour that you would use in the cake. The reason you need the flour is to prevent the almonds from turning oily or pasty in the processor. You will need about 2 cups of blanched almonds to create enough almond meal for this cake. )2 cups icing sugar, sifted6 large eggs½ cup (70 grams) all-purpose flour3 tbsp. (1½ ounces; 45 grams) unsalted butter, melted and cooled1.Divide the oven into thirds by positioning a rack in the upper third of the oven and the lower third of the oven.2.Preheat the oven to 425◦F. 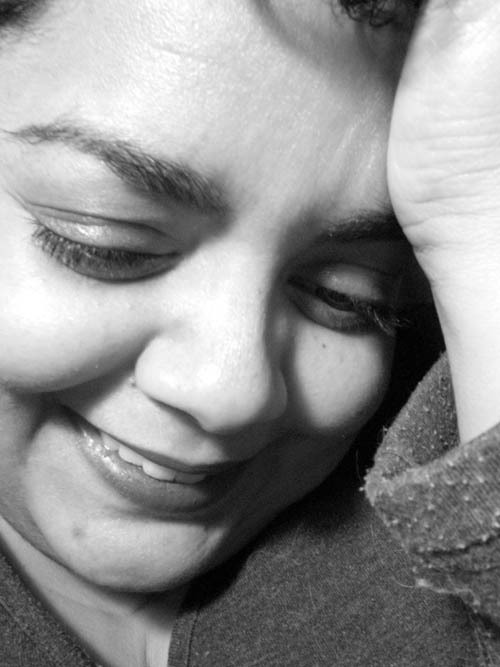 (220◦C). 3.Line two 12½ x 15½- inch (31 x 39-cm) jelly-roll pans with parchment paper and brush with melted butter.4.In the bowl of a stand mixer fitted with the whisk attachment (or using a handheld mixer), beat the egg whites until they form soft peaks. Add the granulated sugar and beat until the peaks are stiff and glossy. If you do not have another mixer bowl, gently scrape the meringue into another bowl and set aside.5.If you only have one bowl, wash it after removing the egg whites or if you have a second bowl, use that one. Attach the paddle attachment to the stand mixer (or using a handheld mixer again) and beat the almonds, icing sugar and eggs on medium speed until light and voluminous, about 3 minutes. 6.Add the flour and beat on low speed until the flour is just combined (be very careful not to overmix here!!!). 7.Using a rubber spatula, gently fold the meringue into the almond mixture and then fold in the melted butter. Divide the batter between the pans and spread it evenly to cover the entire surface of each pan.8.Bake the cake layers until they are lightly browned and just springy to the touch. This could take anywhere from 5 to 9 minutes depending on your oven. Place one jelly-roll pan in the middle of the oven and the second jelly-roll pan in the bottom third of the oven.9.Put the pans on a heatproof counter and run a sharp knife along the edges of the cake to loosen it from the pan. Cover each with a sheet of parchment or wax paper, turn the pans over, and unmold. 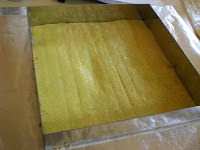 10.Carefully peel away the parchment, then turn the parchment over and use it to cover the cakes. Let the cakes cool to room temperature. For the syrup(Note: The syrup can be made up to 1 week in advance and kept covered in the refrigerator. )What you’ll need:•a small saucepanIngredients:½ cup (125 grams) water⅓ cup (65 grams) granulated sugar1 to 2 tbsp. of the flavouring of your choice (i.e., vanilla extract, almond extract, cognac, limoncello, coconut cream, honey etc. )1.Stir all the syrup ingredients together in the saucepan and bring to a boil.2.Remove from the heat and let cool to room temperature.For the buttercream(Note: The buttercream can be made up to 1 month in advance and packed in an airtight container. If made way in advance, you can freeze the buttercream. Alternatively you can refrigerate it for up to 4 days after making it. To use the buttercream simply bring it to room temperature and then beat it briefly to restore its consistency. )(Update Note: The recipe for the buttercream that is listed below was originally based on the original but we had some typos. It's all very confusing (we're good at confusing ourselves) but here is the short of it: When testing the buttercream, we tested a modified version (we're crazy like that!!!) that had 2 cups sugar, ½ cup water and 1¾ cups butter. Yes. That's right. 1¾ cups of butter. The eggs remained the same. We ended up with a very creamy buttercream. VERY. CREAMY. But we don’t want anyone to be afraid of our modified version so you have the option of using the original version listed below or the quantities we’ve listed here in this note. If you are still confused and want to cry, then please e-mail us and we will comfort you!!! We promise!!! )What you’ll need:•a small saucepan•a candy or instant-read thermometer•a stand mixer or handheld mixer•a bowl and a whisk attachment•rubber spatulaIngredients:1 cup (100 grams) granulated sugar ¼ cup (60 grams) water seeds of one vanilla bean (split a vanilla bean down the middle and scrape out the seeds) or 1 tbsp. pure vanilla extract (Note: If you are flavouring your buttercream and do not want to use the vanilla, you do not have to. Vanilla will often enhance other flavours but if you want an intense, one-flavoured buttercream, then by all means leave it out! )1 large egg1 large egg yolk1¾ sticks (7 ounces; 200 grams) unsalted butter, at room temperature flavouring of your choice (a tablespoon of an extract, a few tablespoons of melted white chocolate, citrus zest, etc. )1.Combine the sugar, water and vanilla bean seeds or extract in a small saucepan and warm over medium heat just until the sugar dissolves.2.Continue to cook, without stirring, until the syrup reaches 225◦F (107◦C) [*Note: Original recipe indicates a temperature of 255◦F (124◦C), however, when testing the recipe I found that this was too high so we heated to 225◦F and it worked fine] on a candy or instant-read thermometer. Once it reaches that temperature, remove the syrup from the heat.3.While the syrup is heating, begin whisking the egg and egg yolk at high speed in the bowl of your mixer using the whisk attachment. Whisk them until they are pale and foamy.4.When the sugar syrup reaches the correct temperature and you remove it from the heat, reduce the mixer speed to low speed and begin slowly (very slowly) pouring the syrup down the side of the bowl being very careful not to splatter the syrup into the path of the whisk attachment. Some of the syrup will spin onto the sides of the bowl but don’t worry about this and don’t try to stir it into the mixture as it will harden! 5.Raise the speed to medium-high and continue beating until the eggs are thick and satiny and the mixture is cool to the touch (about 5 minutes or so).6.While the egg mixture is beating, place the softened butter in a bowl and mash it with a spatula until you have a soft creamy mass. 7.With the mixer on medium speed, begin adding in two-tablespoon chunks. When all the butter has been incorporated, raise the mixer speed to high and beat until the buttercream is thick and shiny. 8.At this point add in your flavouring and beat for an additional minute or so.9.Refrigerate the buttercream, stirring it often, until it’s set enough (firm enough) to spread when topped with a layer of cake (about 20 minutes).For the white chocolate ganache/mousse (this step is optional – please see Elements of an Opéra Cake below) (Note: The mousse can be made ahead and refrigerated until you’re ready to use it. )What you’ll need:•a small saucepan•a mixer or handheld mixerIngredients:7 ounces white chocolate1 cup plus 3 tbsp. heavy cream (35% cream)1 tbsp. liquer of your choice (Bailey’s, Amaretto, etc. )1.Melt the white chocolate and the 3 tbsp. of heavy cream in a small saucepan.2.Stir to ensure that it’s smooth and that the chocolate is melted. Add the tablespoon of liqueur to the chocolate and stir. Set aside to cool completely.3.In the bowl of a stand mixer, whip the remaining 1 cup of heavy cream until soft peaks form.4.Gently fold the whipped cream into the cooled chocolate to form a mousse. 5.If it’s too thin, refrigerate it for a bit until it’s spreadable.6.If you’re not going to use it right away, refrigerate until you’re ready to use.For the glaze (Note: It’s best to make the glaze right when you’re ready to finish the cake. )What you’ll need:•a small saucepan or double boilerIngredients:14 ounces white chocolate, coarsely chopped ½ cup heavy cream (35% cream)1.Melt the white chocolate with the heavy cream. Whisk the mixture gently until smooth. 2.Let cool for 10 minutes and then pour over the chilled cake. Using a long metal cake spatula, smooth out into an even layer. 3.Place the cake into the refrigerator for 30 minutes to set.Assembling the Opéra Cake(Note: The finished cake should be served slightly chilled. It can be kept in the refrigerator for up to 1 day).Line a baking sheet with parchment or wax paper.Working with one sheet of cake at a time, cut and trim each sheet so that you have two pieces (from each cake so you’ll have four pieces in total): one 10-inch (25-cm) square and one 10 x 5-inch (25 x 12½-cm) rectangle. 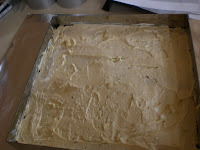 Step A (if using buttercream only and not making the ganache/mousse):Place one square of cake on the baking sheet and moisten it gently with the flavoured syrup.Spread about one-third of the buttercream over this layer.Top with the two rectangular pieces of cake, placing them side by side to form a square. Moisten these pieces with the flavoured syrup.Spread another third of the buttercream on the cake and then top with the third square of joconde. Use the remaining syrup to wet the joconde. Spread the remaining buttercream on top of the final layer of joconde and then refrigerate until very firm (at least half an hour).Make the glaze and after it has cooled, pour/spread it over the top of the chilled cake. Refrigerate the cake again to set the glaze.Serve the cake slightly chilled. This recipe will yield approximately 20 servings.Step B (if making the ganache/mousse):Place one square of cake on the baking sheet and moisten it gently with the flavoured syrup.Spread about three-quarters of the buttercream over this layer.Top with the two rectangular pieces of cake, placing them side by side to form a square. Moisten these pieces with the flavoured syrup.Spread the remaining buttercream on the cake and then top with the third square of joconde. Use the remaining syrup to wet the joconde and then refrigerate until very firm (at least half an hour).Prepare the ganache/mousse (if you haven’t already) and then spread it on the top of the last layer of the joconde. Refrigerate for at least two to three hours to give the ganache/mousse the opportunity to firm up.Make the glaze and after it has cooled, pour/spread it over the top of the chilled cake. Refrigerate the cake again to set the glaze.Serve the cake slightly chilled. This recipe will yield approximately 20 servings. *****************************************************************What is Allowed:•If you are feeling up to the challenge, instead of a square or rectangular Opéra Cake you can make a round Opéra Cake or you can make Opéra cupcakes. You can also use your joconde to make mini Opéra Cakes. Go nuts!•You can use any flavouring you wish in the joconde, syrup, buttercream, ganache/mousse and glaze as long as it is a “light” flavour (vanilla, coconut, honey, banana, almond etc. ).•If you are feeling daring, you can use fresh fruit in between your joconde layers.•If you have another version of buttercream that you would like to use, you may do so as long as it remains light in colour and flavour. By light in colour and flavour what we mean is light colours (yellow, white, ivory, cream) or light spring colours (blue, pink, green) but they should be light shades. NO DARK COLOURS (black, brown, gray). •You can use only the buttercream to fill and top your cake (prior to the glaze) and omit the step of making the ganache/mousse.•If you do not like the white chocolate glaze, you are free to either leave the glaze out (although a traditional Opéra Cake has a glaze) or you can use another glaze as long as it remains light in colour or flavour (vanilla glaze, lemon glaze, etc. ).•You may decorate the outside of your cake in whatever manner you wish (piping, fresh fruit, icing sugar, flowers, etc. ).•Whatever dietary changes are required to meet needs based on allergies, dietary requirements, etc. (But this applies to you only if you have allergies or special dietary needs. )What is Not Allowed:•ABSOLUTELY NO DARK COLOURS OR FLAVOURS: no chocolate, coffee, cocoa, etc. *****************************************************************While we realize the recipe is very long, please understand that we've endeavoured to include as full and complete a recipe as possible to help you with this challenge. And don't be daunted by the length of this recipe, most of us that tested it were able to make it one day. Please remember that if you want a copy of the recipe in Word, just e-mail us! *****************************************************************Here is some additional information that will help you with this challenge:The Elements of an Opéra Cake:Joconde: The base of an Opéra Cake is a thin sponge cake that is made using nut meal, traditionally almond meal (finely ground blanched almonds).Syrup: The joconde is flavoured with a sugar syrup that can be flavoured to suit your tastes.Buttercream: The first two layers of the joconde are covered in a rich buttercream. This particular buttercream is made with a syrup, eggs and butter.Ganache/Mousse (optional): In some recipes, the final layer of the joconde is covered in a ganache or mousse. While not hard to make, this makes the recipe quite involved. We are giving Daring Bakers the option of either using the buttercream to cover the final layer or, if they’re feeling up to it, to go ahead and make the ganache/mousse.Glaze: The final step to an Opéra Cake is the glaze that gives the cake a very finished and elegant appearance. I'm happy to see that you have finely found pandan juice/extract... Your cake looks fantastic! I bet it tasted great too! Your Auntie Mame may be used to pound cakes and gobblers but if you keep putting these beauties before her, she will sing a new tune in no time! Wonderful!!! I am not all that familiar with Pandan but now I need to know!! Keep on baking and keep the flour flying!!! Oh my, look at those directions! You Daring Bakers are dedicated! Your Opera cake looks very glamorous and tasty too! Wow!! What a spectacular effort. Your decorating skills are to be congratulated. You DB's realy amaze me..This cake is really difficult and you have done really well..come out with flying colors..Love the whole look of the cake including the gum paste flower :)) Congrats once again!! Pandan flavour?!! Great Idea! I love the cake and I love the gum flowers even more!! Great job my dear! wow--looks awesome! i've seen pandan, too. it's intriguing, but i have no clue what it's like...i'll have to do like you and find some! Wow, it looks precious with the beautiful flower on top! I bet your mum loved the cake. Despite all the problems it looks perfect! your opera is gorgeous!! i love the flower on the top :-) great idea!! So beautiful Courtney- I love the flower duet the colours and the flavours! Beautiful!!!! The flavours are new to me, but your cake looks as exotic as its name. i've been wanting to try pandan. it's intriguing. your cake is spectacular. 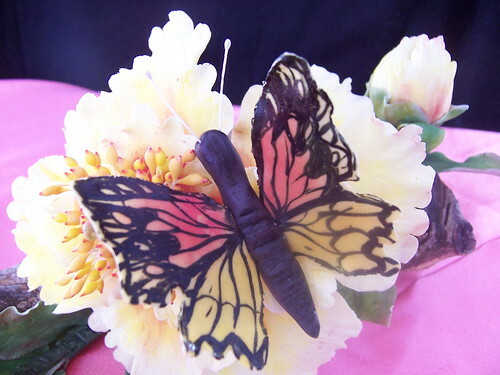 Very creative and so pretty. Very creative! Love the flower decoration and your flavors combos sounds good! You did it Glahah and with such style and flair. Love the dramatic decoration on your DB challenge. Very creative!!! Your cake is gorgeous and I'm intrigued by this pandan?? I have never heard of it before but look forward to discovering what it is. such an artistic piece of work! such an effort you put on! marvellous! 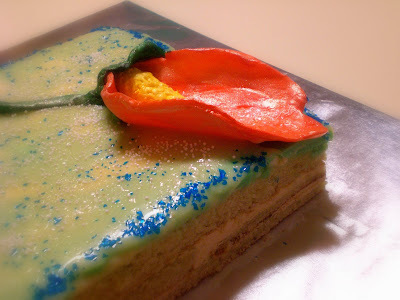 The flower looks lovely and it's a pity the cake must be cut. So awesome and beautiful! Great job! Pandan is the new Matcha! I just love it, Courtney! You were so artistic as well with the lily on top! Great job! Huge amount of creativity here Courtney. I am incredibly impressed seeing as I barely got mine made let alone decorated!!! Pandan, the new Matcha . . . Your cake is Dramatic Opera. Beautiful decorations. I would so love to try a taste! Courtney, you always impress me with everything you make. This opera cake is just gorgeous. I wish I had the patience to learn how to make all those beautiful touches that make a delicious cake look even more delicious. Yummy! Your cake is simply beautiful, Courtney, and I'm sure I would have loved it, too. I like the duet, too! Courtney, I can always count on you for exotic and creative ideas! Pandan? You got me! I never heard of it, I'll be googleing it later. lol You are a "Maestro" in the kitchen girl!!! Wow, very daring and elegant! It's beautiful courtney and I love the rose on top too. You used gumpaste! Hooray! :) My research feels validated for no good reason. that flower is amazing! great job. that is one crazy flower you got there. wow! mad! Beautiful inspiration, Courtney! I've loved "Viens, Mallika..." since British Air had that ad campaign back in the 90s. Wow you are the second one that i saw using pandan!! Great job! We are very curious about Pandan juice, where did you find it? How could you describe its taste? You are the most creative person we know, your cake is a kind of a masterpiece. Our next creation is ravioli, it will appear as soon as possible. Take care and keep on being an artist! I think it's absolutely gorgeous! I had some problems with my mousse sneaking through as well, but nothing some toasted coconut on mine couldn't fix! I think yours looks so elegant - that flower really takes it over the top. WOW - your flavors sound so delish and that flower is so beautiful!! Very impressive, with that beautiful flower on top! I Love the flower duet Courtney!! Beautiful colors..so bright, just like you! *Overcome* a baking challenge? My dear, you NAILED it. Pinned it to the wall and it's begging for mercy. Your opera, your floral duet... brilliant! From what I've read of pandan, this sounds like a great flavour combination. The decoration is exotic. You will be spoiling the family with these great dishes! Wow. Pandan....I just figured out what Matcha is and it's already out. Nice work! What a cool challenge. Your creation look like it came out of a Van Gogh painting. Really cool! I never worked with Pandan, i'm intrigued now. Great work, it's beautiful! Such a pretty cake! I would be a happy girl if someone presented me with such a cake. Well done! Hugs back you Courtney. I had not heard of that Opera but googled it on You Tube. It is beautiful. I think I would like Opera Cake very much. This looks beautiful! Pandan! Oh that's just genius :) The new matcha...love that! Pandan is used a lot in our local sweets (and savories!) so that makes me very happy :) Fantastic Opera! Simply amazing! I can only dream to have such talent and patience. Wow. You were truly daring with the flavors and the decoration. Well done! 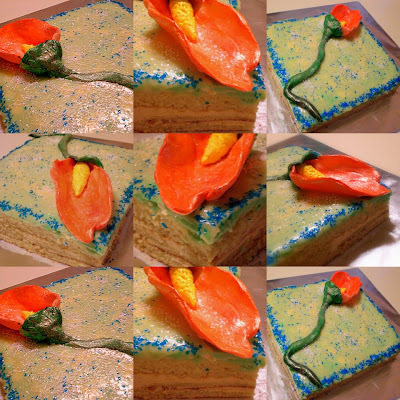 Love that opera, and love that cake, especially the vivid flower on top. I am unfamiliar with pandan, and none of the web searches actually describe the flavor. What does it taste like? Anyhow... Very pretty! I love the Anthurium on top, and the colored glaze gives it almost a marbled look. Great job! Thank you all! In regards to what Pandan actually tastes like, the flavor mixes well with coconut and chocolate. In this particular cake the flavor of white chocolate was domninant. My reaction was that it tasted like a vanilla /almondy. The essence has a sweet aroma that be described as pleasing.If you dont like the slight bitterness of matcha, I think you'll like this! I read that it is used like vanilla is used in Western Countries.Hope this helps. Again thank you all for your comments! Brilliant! Yours is one of the most intriguing flavor combinations I've read about! The decorations are lovely, as well. Gorgeous job! The cake looks great and sounds amazing. Wow! Your cake looks fantastic! You aare very creative! I love this artistic interpretation, Coco! 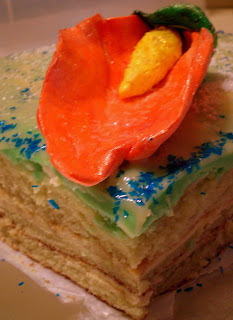 Very exotic with the flavors and the decorating. Great job! Wow very cool decorating. I've always wondered what pandan tastes like. I'll have to look for it next time I'm in chinatown. You did a fabulous job on your cake. I love the flavors and the beautiful decorations. Seriously, I got dizzy just reading about it. Love the calla lily. You are a force, woman! Very nice job! Love the extra time you took for the flower on top. You are very creative! 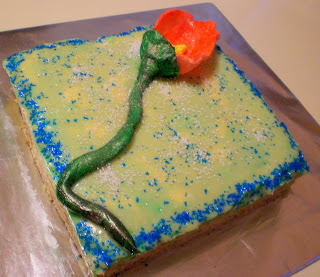 I like the flower you made for the cake. Looks impressive! Job well done! Very creative use of flavors and very cool decorating. Wow, Courtney. I'm impressed. Really. I love that you incorporated matcha. That is so awesome. Your opera is awesome. Wow! Oh, and your flower too. Pandan? A totally new one for me. Gorgeous cake. My Blog Reading List Sorted By The Most Recent 25.There is So Much To Love!!! Bagaimana Cara Memilih Tenor Pinjaman Uang Online Terbaik? Don't miss any updates from chubbycheekgirls Bloglovin helps you follow the blogs you read by letting you know when they update. Insulate Your Atticâ€¦with Marshmallow Fluff? Plane Crash Cake... Bad Karma? I've been a baaad, baaad Daring Baker!!! eat me, delicious - Ashley M.